Today is the last day of spoilers and we're taking the day off for July 4th celebrations, so our spoiler page will be updated tomorrow. Also, be sure to stop by Sunday because we'll begin posting set reviews. They'll run Sunday through Friday covering each of the five colors and Friday's review will be multicolored, artifacts, and land. Because we have a ton more cards to look at, we'll keep this short by covering the cards left from yesterday. 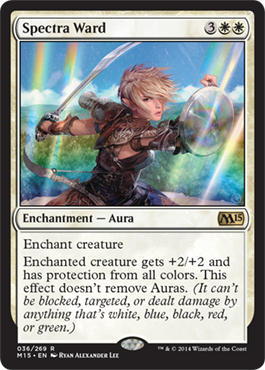 Spectra Ward is an enchantment that boosts your creature and gives them protection from colors. Normally by giving something protection, anything attached and a particular color should fall off the creature. This prevents auras from being removed but also prevents it from being targeted by any more auras. Considering everything else around, it really isn't that great. 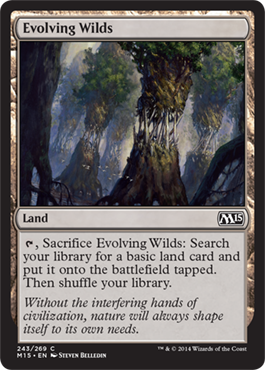 I think this will be one of the greatest cards out of M15. For two mana, you can make any artifact a 5/5 creature. This means an artifact that isn't a creature becomes a 5/5 creature with all its other abilities still tacked on. 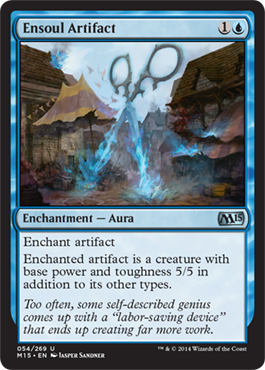 The best thing is with the cards coming out in M15, you can easily attack with a 5/5 on turn 2 using this (and put it on a Darksteel Citadel, no less). The secret? Zero costing Ornithopters, Darksteel Citadel, an Island, and Springleaf Drum. Turn 1 is a Citadel plus a Drum and an Ornithopter. Turn two, you target Darksteel Citadel with Ensoul Artifact using the Island and tapping the Drum and Ornithopter for the other mana needed. Then the fun begins! Thanks to everyone who hung out with us the past two weeks checking out spoilers. Be sure to check back on Saturday or Sunday for the updated spoiler page.